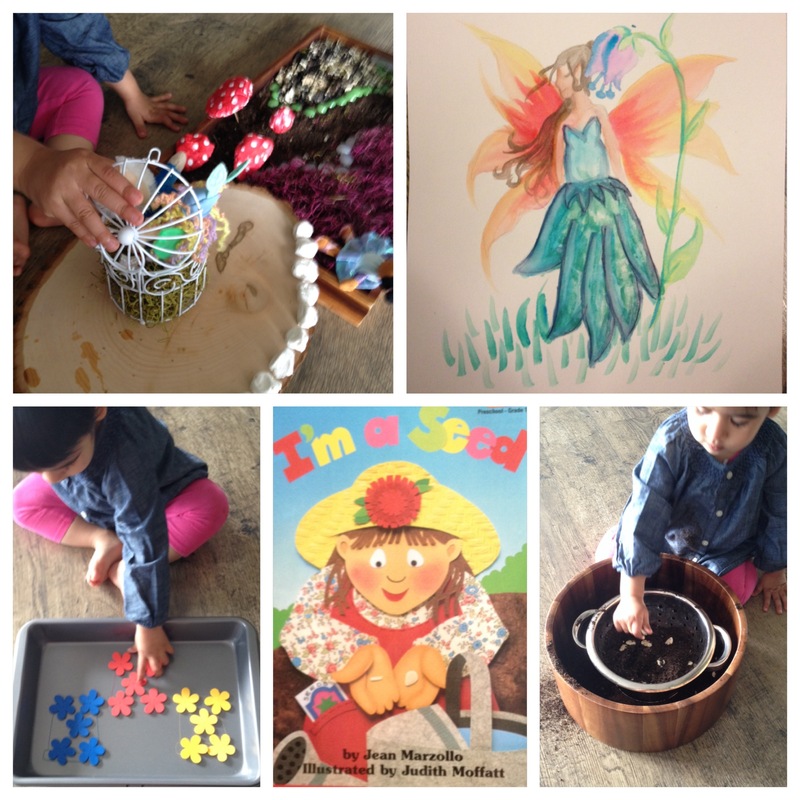 I’m a Seed by Jean Marzollo – R enjoyed the book we read today and listened intently. It is about two seeds (a marigold and pumpkin seeds) that compare their growth. I love the illustrations in this book! I had wanted to make a fairy garden outside in our actual garden, but the ground was super soggy after the rain, so I made one inside. I combined two wooden trays with a tree stump tray. I used soil, water and variety of mosses ground cover in the trays. I added embellishments with gems, modelling clay mushrooms, flowers from the garden, a wooden fence and a metal bird cage. Finally, to enhance imaginative play, I added R’s finger puppets that her auntie got for her. R learned that not all things we play with are to be destroyed. I used the command, “nice” to encourage her to not be destructive. She actually listened and played quite gently with everything. R and I counted the flowers in the water. She splashed the water with her hands and said, “tash tash” (splash splash). I asked her to put the puppets to sleep. She placed two of them on the moss grass and patted them and said, “nini” (the punjabi word for sleep). She made the wizard and unicorn hop around while saying, “hop hop hop”. She loved putting gems and the puppets into the bird cage and saying, “cha-thi” (punjabi word for peek-a-boo). All together, there was a lot of language skills development and imaginative play going on! a. With older children, discuss what s/he thinks belongs in a fairy garden. b. Have him/her make their own fairy garden adding items s/he thinks are necessary. We did a mother’s day craft involving a hand print. I painted R’s hand and had her stamp it onto a piece of water colour paper. 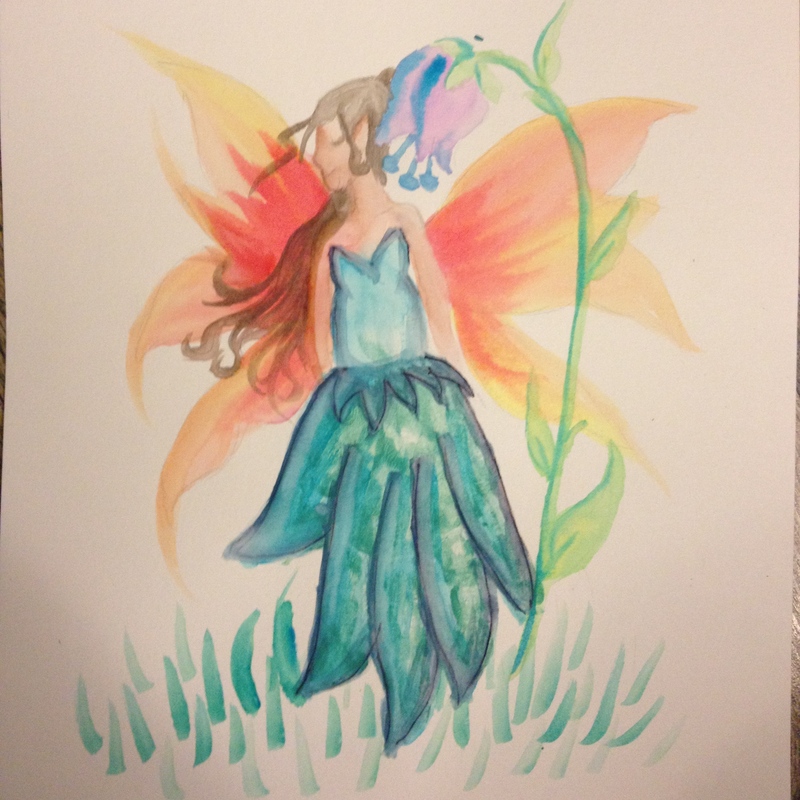 I then attempted to transform the hand print into a garden fairy to fit in with our theme for the week. a. Older kids can do their own hand print transformations. I used my Cricut machine to make blue, red and yellow flowers out of foam. I attached magnetic tape to the back of each and used a metal cake pan for a magnetic surface. We used the flowers to first play, then sort by colour and finally for counting practice. The use of red, blue and yellow foam was purposefully done so that we could continue to to have exposure with the primary colours. 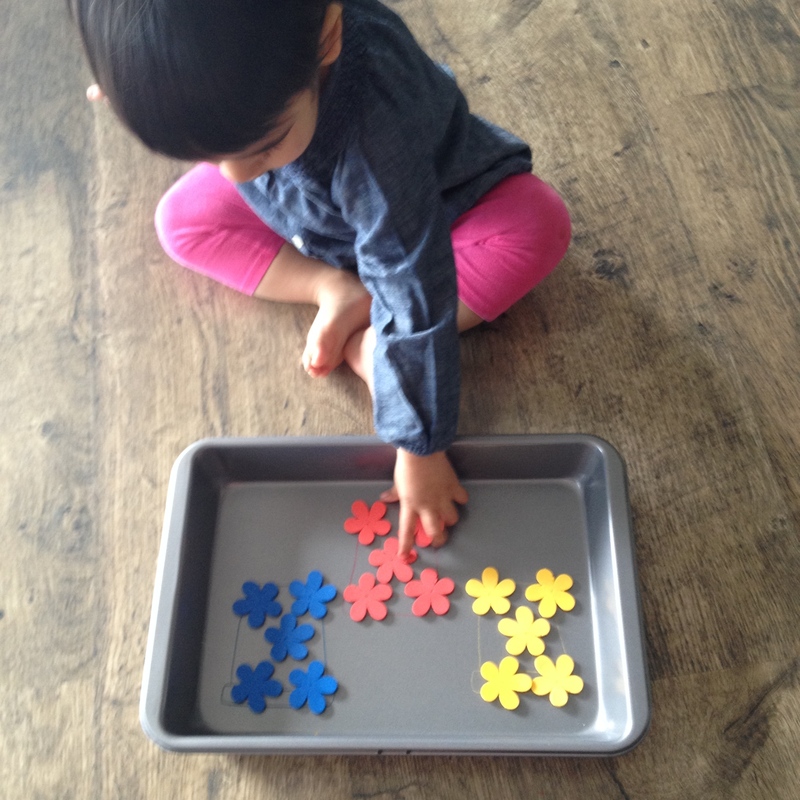 All of the activities with the magnetic flowers required full support from me since R is not able to do them independently yet. a. Mix up the coloured flowers and ask the child to sort them according to colour. b. Have the child point to one flower at a time and count aloud. c. Ask the child to hand you a flower of a specific colour and see if s/he is able to do so. I put dirt and Lima bean seeds in a colander. 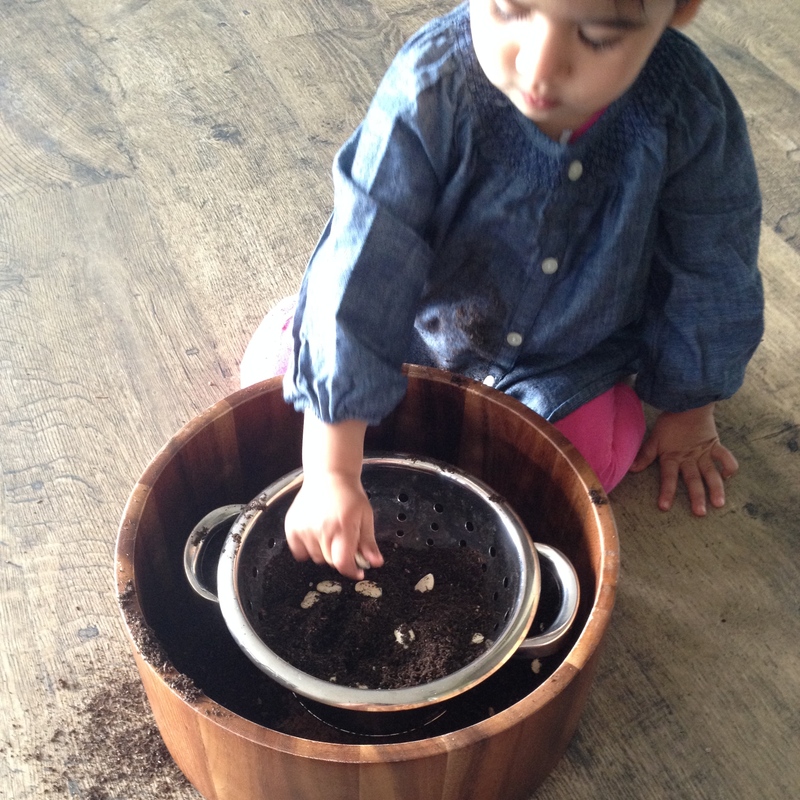 R’s initial instinct was to dump the soil and seeds; however, together, we practiced how to shake the colander back and forth in order to separate the dirt from the seeds. She preferred catching the dirt while I shook the colander.